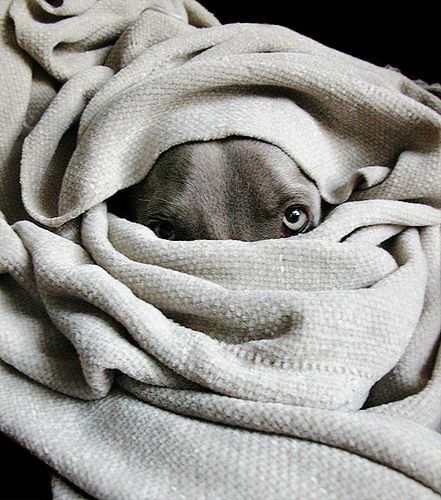 Um, it’s freezing outside. Actually no, it’s BELOW freezing outside. As much as I love cozying up in big chunky sweaters when it’s frigid outside, I have to admit, this weather is making me feel just a little…cabin fevery? Thankfully we aren’t trapped under feet of snow, but it’s so cold you just don’t want to be outside. Also, our Prius, which is supposed to be a transforming robot, apparently takes 14 years to heat up. And our house, which was built in 1792, doesn’t have real heating. Which is why I’ve been hiding under the blanket on my couch, therefore limiting me to the outside world. And you know what? I miss the outside world. On the plus side though, I’ve been cooking up a storm. Which is why I have 15 new and delicious recipes to share with you this week, like blueberry muffin oats and crispy baked shrimp. Before I share those though, I have to share something even more exciting than crispy baked shrimp, a GIVEAWAY! (Cue loud music, flashing lights and cage dancers). 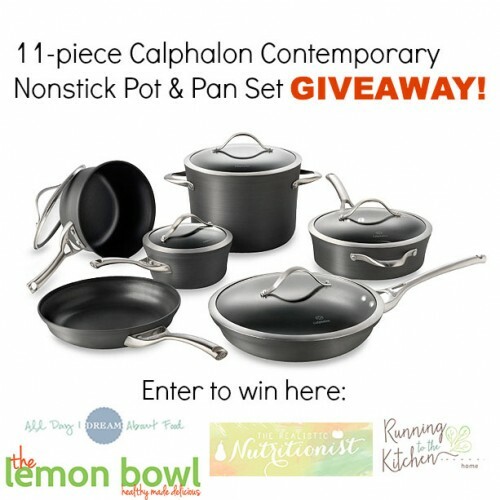 I’ve partnered with a few of my favorite healthy food bloggers to give one lucky person a brand spankin’ new 11-piece Calphalon pot and pan set! Wanna know the best thing about this pot and pan set? Besides the fact it’ll be FREE to one of you lucky readers? It’s completely dishwasher safe. If you cook as much as I do, that is probably the most alluring thing ever. I can’t tell you how many minutes of my life have been wasted soaking, scrubbing and drying my pots and pans. I could probably have run a marathon in that time. I mean, I wouldn’t because I hate running, but you get the picture. Imagine the time you would save NOT hand washing your pots and pans. As you mull that over, enter to win the amazing set in the widget below. And be sure to visit my friends Carolyn, Gina and Liz while you’re at it, because they are fabulous and co-hosting this little giveaway with me! *GIVEAWAY ends January 18th at midnight. GOOD LUCK! I'd make a stew, to put over noodles! With this ridiculously frigid weather (And more snow coming today!) honestly, Id probably start with soup! Definitely something warm and cozy like soup or chili! I have a calphalon set (yay wedding registries!) and I absolutely love it. Even heating and the hard-anodized set doesn't stick and is a breeze to clean! Some yummy split pea soup. I would either do Steak Diane or Steak Au Pouive 1st as I love those dishes. I'm thinking I'd make my huge stir fry. My current pans are never big enough! I could get rid of all of my old pots and pans that are so hard to clean! Awesome giveaway! I would give the set to my daughter as she will be moving into her own grown up place in a couple months and this would be a great set for her. I would make an omelet to test the nonstick capabilities! I would make homemade pasta and sauce in these new pots and pans if I won! Probably a pasta dish because that's what we Italians do! Coq au vin - I've had a hankering for that lately. I've wanted to try making polenta on the stovetop for a while. I would make breaded chicken and pasta on the side. I'm a student desperately in need of cookware so I think I would probably be making something simple like pasta. Or maybe some stir fry. Probably a big old pot of soup or chili. There is nothing better in this freezing cold weather! I don't know what I'd make first, but I'm in the process of pouring through your archives and saving all the yummyliciousness for future reference! This weather calls for chili, tacos or soup. Those are great pans for any of those dishes. I've been wanting to make my own chili from scratch. Cook up some new recipes to keep us warm til Spring! I'd make something complicated so I could use a few of the pieces :) Beef bourguignon would be first! If I had more time due to not washing pots and pans . . . I would go to CrossFit more! I've been making lemon curd everyday lately. I can't get enough. What would I make? Pfff, you mean, "What would [my] partner make?" And the answer is probably chicken noodle soup, because we have the sniffles leftover from the plague. The first thing I would make in the Calphalon pans would be breakfast...so, pancakes! I would make a soup first. Maybe a chicken tortilla one. So many things! First dishes that come to mind - pasta bolognese, chili, lentil vegetable soup. What a great giveaway! I'm about to take a trip to India, so I would take a stab at re-creating some of the delicious food I know I'll be having there! If I won this great set of pots and pans, the first thing I would make is my favorite "Hot Chocolate" Cake. Making the chocolate sauce takes a pan that is easy to clean and can take the heat of a hard boil, and this one has one just like that. Hope I am your winner! Thanks to you and your blogging partners for offering this giveaway! I would love to make some fresh pasta and homemade sauce! What a great giveaway! I would make skillet lasagna! I would def. make a nice hearty soup! I would be experimenting and creating new recipes for my family in these pans. They will inspire me to try some something new . My family thanks you! I would make a pot of soup! I would make a big pot of chili! I would love to make a stir fry in new Calphalon cookware! The first thing that I would make it a big pot of turkey chili. I would make chicken tacos! I would make a chicken masala curry. I'd make a Valentine's Day dinner. I make a really good pumpkin cream sauce for mushroom ravioli. That would hit the spot in this cold weather! A super yummy risotto would be on my list to make first with these awesome pans. We have been eating a lot of soup lately. So soup may be the first thing I cook. I would make a one-pot meal with pasta, mushrooms, spinach, artichoke and sundried tomatoes. I need new pots and pans soooo bad. My daughter just got remarried,she & her husband each have 3 kids so they just created another Brady Bunch. I would give the set to them! I'd make beans and rice with fresh veggies, fresh herbs and a bit of parmesan cheese. Thanks for the contest! The first thing I would cook is chili! I'd make a big fancy vegetarian meal for friends and family! A big pot of chili. It is freezing and I need something to warm up. With this weather i'd start with a big pot of chili! I would love this set, so many of my current pieces have damage. I cook everyday, homemade, whole, natural food to keep cancer out of our lives!! I would start with soup. It's one of my favorite things to make and perfect in the winter. I would make a large pot of chili! I would make chicken and dumplings,hashbrowns,corned beef hash, and southern style french fries first. I would make soup first. Pasta with a spicy sauce would be fun. I would make stews and soups! With the weather this cold, there really is nothing better than warm comfort foods. I would start with the basics: pasta in the big pot, tomato sauce in the small one. Perhaps a good hearty stew. I could so use a new set of pans. Big time! Definitely new soups! I just made a light cream of broccoli soup and it's so delicious and filling. I used to only make pastas but this would allow me to expand! Spaghetti and Meat sauce with Garlic Bread!